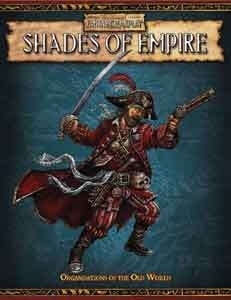 • Aldorf Dockers: These toughs rule the quayside in the Empire's capital. • The Brothers of Hendrick: Dedicated members of the Cult of Hendrich, the Brothers are not afraid to get their hands dirty. • The Dreamwalkers: These servants of Morr hunt Undead and Necromancers across the Old World. • The Glorious Revolution of the People: Agitators with a cause, they fight for the common people of the Empire and an end to the monarchy and the nobility. • Hedgefolk: Scattered across the villages of the Empire, the Hedgefolk use traditional magic to serve their communities. • The Imperial Navy: From the coasts of Nordland to the rivers of Reikland, the navy keeps the Empire safe from raiders, marauders, and pirates. • The Knights of Magritta: Once a crusading order from Estalia, the Knights are now a secret society with a long reach. • The Quinsberry Lodge: This organisation ensures that Halflings across the Empire get fair and equal treatment. Or else. • The Roadwardens: Travellers count on the Roadwardens to keep the highways and byways of the Empire safe in the face of beastmen, outlaws, and other threats. This title was added to our catalog on October 01, 2009.